“Bunnies” (actually hares) are common along the riverbank in the Saskatoon area. Mom’s survival strategy is to leave her young alone all day, returning only in the early morning and at dusk to feed them. They have no scent, and will stay very still if disturbed. This is so that predators, such as foxes, coyotes, dogs and even people, will not smell them or see them as they have no natural defenses and cannot run fast enough to escape. So they are “hiding” even when they are visible to us passing by. 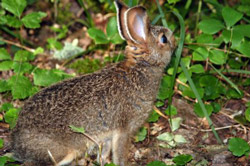 If you come upon a young hare on the side of a trail, and want to help it be safer, please do not touch it with your hands, or you will put your scent on it, and it will be endangered by predators. If you must move it, lift it using a handful of leaves or grass to prevent your scent from rubbing off onto it, and place it no more than 3 or 4 feet from the original location. It must not be too far, or Mom will not find it. These animals do very poorly in rehabilitation and greatly benefit from being left alone to be parented by a natural Mom! We have the White-tailed Jackrabbit (really a hare) (Lepus townsendii) around Saskatoon, the Snowshoe hare (Lepus americanus) mainly further north in the forest, and the Cottontail (Sylvilagus floridanus and Sylvilagus nuttallii) staying further south in the province. White-tailed jackrabbits are found throughout west-central Canada and the United States. They range from the Great Plains of Saskatchewan and Alberta east to extreme southwest Ontario down into Wisconsin and across the continent to the Rocky Mountains with a southern limit in central California. The Snowshoe Hare is even more broadly distributed from coast to coast across Canada and follows the trees down the Rocky Mountains into the US. White-tailed jackrabbits prefer open grasslands but thrive in pastures and fields due to their speed and ability to outrun predators. Thus they are found in the plains of central and southern Saskatchewan. Snowshoe hares, by contrast, prefer mixed woodlands, bush, or swamp areas. Therefore, they are most abundant in the parklands and northern forests of Saskatchewan. Jackrabbits have enormous ears and large hind legs, which enable them to jump quite high as a means of escape from predators. They weigh from 3 to 4 kg, and change their colour with the season. The extent to which they change depends upon the snowfall average. Here in Saskatchewan, both jackrabbits and snowshoe hares turn quite white, whereas in the southern range for jackrabbits, hardly any colour change is noted. The tips of their ears are black year-round. The colour changes back to the grayish-brown in the spring. The Snowshoe hare has large well-furred paws that give better footing on the ice and snow. The ears are shorter than the Jackrabbit’s. The snowshoe hare is inactive during the day, preferring to forage in groups under cover of darkness. The breeding season for both can start in February and peaks from March to July. They can have 1-4 litters each year although our northern hares have only one, with an average of 4-5 young each time. Females often create nests for the protection of their young from dried grass, leaves, and hair. At birth, the young weigh approximately 90-100 grams, are fully furred, have open eyes, and limited mobility within half an hour. The young begin to forage at approximately 2 weeks of age and are fully weaned at one month. This is a marked difference from (both types of) cottontails. 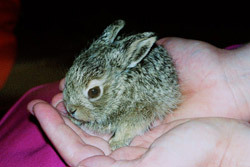 In contrast to the hares, cottontail young are blind, naked, helpless and about thumb-sized at birth. They are born in a burrow or a hollow in a field lined with grass, roots and down. The young are left alone during the day, with the mother returning each evening to suckle them. She covers them with a matting of grass to conceal them during the day. Their eyes open at about 7 days and at two weeks of age, the brood disperses. By the end of a month, they are independent and fending for themselves. They bear 3-4 litters between May and August, each with 4-6 young. The Nuttall’s cottontail is found in southwestern Saskatchewan and has shorter ears in comparison to the Eastern cottontails. Both have a grayish-brown body and whitish under parts. Cottontails do not change colour in the winter and always have the distinctive white powder-puff tail that gives them their name. 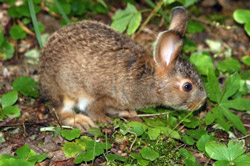 The cottontail is about 12-16 inches long and weighs 1 1/2 to 5 lbs. 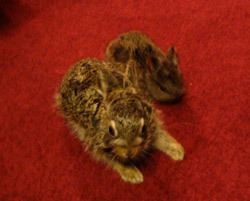 Cottontails are nocturnal and generally have several shelters, each with two exits. These are usually deserted burrows of woodchucks, skunks, foxes, or badgers, as the rabbits do not dig their own burrow. None of these species hibernates and all are active during the winter. They are vegetarian, eating all manner of grasses, twigs, flowers, and bark, often damaging trees by “girdling” them. All lagomorphs are a food source for meat-eating animals such as wolf, coyote, fox, hawks and owls among others. As such they are a valuable contributor to the balance of the eco-system.